Don’t discard the broccoli stalk. Even the thickest stalk can be used and is quite delicious. 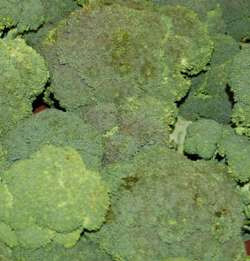 Simply peel the outside skin from the stalk and cook as you would the rest of the broccoli. Cutting the stalks into thin slices and adding to stir-fry makes a great star-shaped addition to the appearance and texture of your meal. Broccoli contains 11 vitamins, five vital minerals, plus protein with all nine essential amino acids.